This came out in TheStar today. However, you may want to just read from below. There are a lot of posts from me on this company i.e. from the early days of its change of hands in substantial shareholdings. Be prepared for WCE to do some fund raising - I am not gonna speculate how it is going to do it as I had the wrong theory once. If however WCE as mentioned would be collecting revenue earlier, there is a perception that some of those revenue will be equitised hence the need for fund injection could be lower than expected - which is a good thing. As below is a portion which is picked up from its 2016 Annual Report - which says a subsidiary is required to maintain a financial service ratio of at least 1.25x and debt equity ratio of not greater than 80:20 upon the toll commencement. (Keyword: upon toll commencement). Hence, it will not need to raise money as fast. Personally, I have made losses from this stock considering my purchase at average of RM1.10 to now being traded at RM0.90. However, if you read most of my articles on this, I do expect a long term hold on this company as a hopefully decent retirement fund and part of it for my children. I am not sure I will still be around when this concession ends i.e. 2064/65 or even more (do continue to read this blog to see I am still writing). For some of you it may be grandchildren, as this is a 50 + 10 year concession! The RM0.90 is in fact a good opportunity for me to collect more as I cannot imagine a RM900 million company will be building the second longest tolled highway (and in better part of country economically) in Malaysia. Medium term - over next 2 years, I do not expect WCE to perform well in its income statement as it only projects to make RM10 million a year from construction and the other holding that it has i.e. Bandar Rimbayu may not be doing as well due to the poor outlook for properties in the near term. total amount of equity raised is 800 mio, balance approx 400 mio. drawdown of 1 to 3, the debt component is subject to a preset ratio as above. that means if you require rm5.9, the debt component will be rm4.74 with equity contribution of rm1.16. that said unless the costs of construction has declined, the equity portion will have to be injected before the highway can be completed. 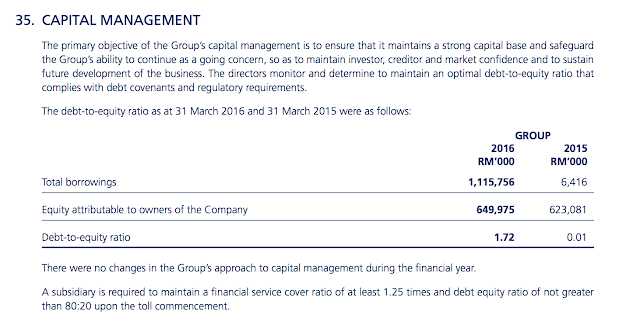 At the agm it was revealed that the cash sitting in the balance sheet now are proceeds from the sukuk with a lump sum drawdown. you have a negative carry situation now with the cash deposits earning less than the bond coupon. as for equitising the toll collection, the amount if factored in will be insignificant when compared to amortisation toll concession. Felicity am i reading this right. my point here is that there is no possibility of putting off the equity injection of rm400 mio when the lenders require simultaneous contribution to an account based on the preset ratio to fund the rm5.9 mio. thanks, it was very gracious of you to admit a mistake but i think you are not completely wrong. 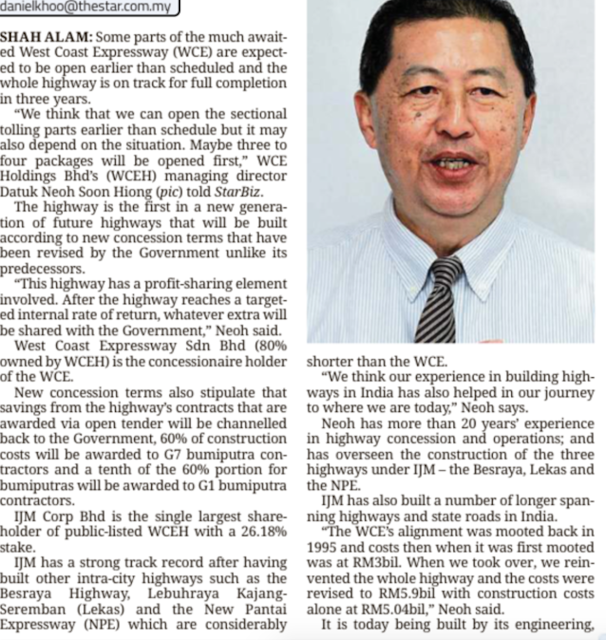 As you read today's article on the star, through the phased opening of the highway, they may be able to pick up revenue of around RM150 - RM250 million prior to full completion of the highway. That can be channeled to the capital portion of the project as its operational costs is not high. The only lumpsum drawdown is the RM1 bio sukuk, the rest are phased drawdown as and when needed. Assuming around RM150 million is being capitalised, the fund raising is lesser by the same amount. WCE Holdings needs 80% as 20% remaining is IJM's part. Additionally, it will profit RM50 million from the construction which again can be capitalised. The same AGM approved private placement up to 10% which I am not very happy of. The way I read it, it will need lesser amount of equity if it can have significant revenue prior to completion. Unknown, I think from the news report, equity raised to date is RM400 mil, with RM800 mil to be raised (instead of the other way round). Felicity, how did you calculate the pre-completion revenues of RM150 mil- RM250 mil? Seems a little optimistic as he mentioned only 3-4 sections to be opened before the others. You probably know this, but depending on what was negotiated with the lenders, pre-completion revenues may not count as equity & have to be used to repay lenders first. Also, the definition of 'Commencement of toll' needs to be clarified - is it at the point of the official opening of the entire stretch, or from the 1st opening of certain sections? hi tabula, it is right in the press he quoted raises RM400 million. However if you remember, the last rights RM450+ mio. Earlier it has also done a private placement of RM50+ mio. It has also sold part of Rimbayu for RM50 mio. Additionally the sale of Talam transform was for RM80 mio. Including some of the funds it gotten from dividends for Rimbayu, the number sounds nearer to RM600 mio. 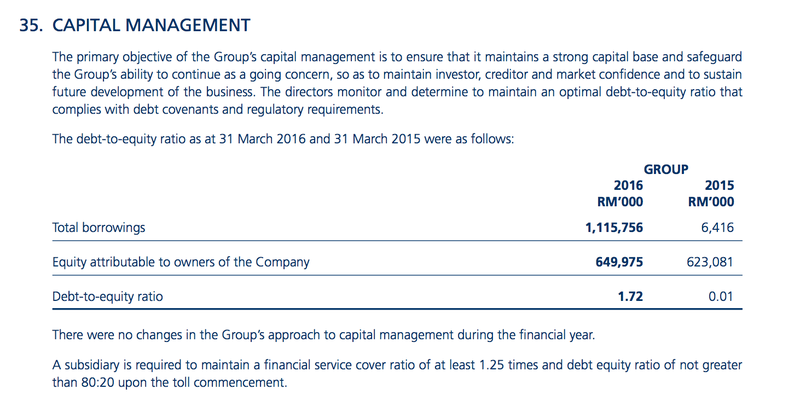 When the CEO mentioned RM400 mio, probably WCE Holding has so far injected that amount into the subsidiary. I think misquoted. Also, why I think the revenue between RM150-250 mio. Did some calculation, the way I see it WCE will open up the highway by phases between 2018 and 2019. So between the earliest one and last may be 15 to 18 months. One full year of collection for its first year, I am presuming RM400 mio to be collected. Taking an average, RM150 - 250 may not be that optimistic. Perhaps if you guys get a chance, you can try to take a look at the progress of WCE and which section of WCE will be open. I am with Felicity on this as I don't think his projection revenue is too optimistic.